When Julie and I first started Careclean Essex, we did all the jobs from: cleaning to quoting to finances to answering phones to maintaining the vans etc etc! As the company has grown, so has our team, which has enabled us to take on more defined roles. I oversee the general running of the business, manage and train staff and oversee Careclean’s marketing and customer-management. However, I still try to get involved in all areas of the business and particularly enjoy interacting with our customers. For this reason, one of my main roles is quoting, which I usually do 3-4 days a week. During quotes (or Healthy Home Audits as we like to refer to them), I visit potential customers’ homes, find out their needs, examine their carpets/upholstery and advise them on maintenance and the types of clean we can offer. I leave them with a Healthy Home Report, which includes a range of cleaning packages for them to choose from. I really enjoy these visits as i’m out and about meeting people in my local community. 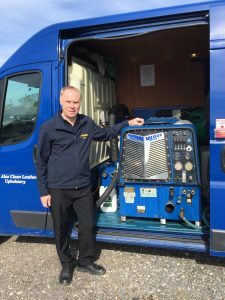 When I started Careclean many years ago, I used to do all the cleaning, however now we have a few fantastic cleaning technicians who do most of this. However, I can spend 2 days a week cleaning if we are particularly busy. After a day of quoting/cleaning, I drive back to our office. I catch up with Deb, update her on how the quotes went, booked jobs etc. Whilst in the office, I also deal with any enquiries that have come in for me. I love my job because it is so varied. From cleaning to training new staff to creating customer newsletters, everyday is different! My favourite part of my job is the lovely relationship I have with our customers. It’s always great to have a coffee and chat with our regular customers, and also to meet new ones! Talking about meeting new people, i’ll leave you with a funny story.. I was cleaning in a block of flats recently, and ran downstairs to grab something from my van. When I returned to the flat, I was confused to find a lady I didn’t recognise (although she was very friendly and offered me a cup of tea)…it turned out i’d gone to the wrong flat! I apologised and resumed my cleaning in the correct flat! Thanks Kevin Barber! Keep a look out for our next ‘A Day in the life of…’ article coming soon!